With hot new games like Super Smash Bros. Ultimate set to be released soon, you’re going to get some serious usage out of your Nintendo Switch in the coming months. Do you really want to have to worry about your battery dying while you’re in the middle of playing an awesome new game. No, of course you don’t, and thankfully there’s an easy way to make sure your gaming sessions aren’t interrupted when you’re on the go. 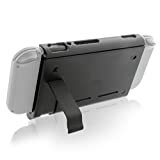 The Nyko Power Pak is a simple attachment that snaps onto the back of your console, doubling the battery life of your Switch. There’s probably no better way to spend $25.